11 Artworld Myths Debunked in Who Says That’s Art? Art is anything a purported artist intends as such. The traditional distinction between “fine” and “decorative” art should be discarded; it is an arbitrary invention of 18th-century European culture. Art has progressed since the 19th century. Photography has made traditional realist painting pointless. “Abstract art” is just another style of art. 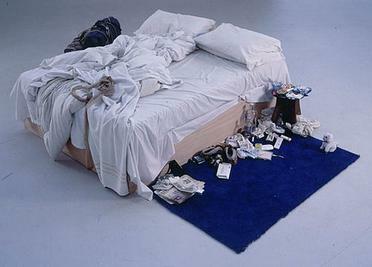 Something that blurs the distinction between art and life (such as Tracey Emin’s My Bed) can still be art. Marcel Duchamp invented “conceptual art” with his readymades. Robert Rauschenberg “redefined painting” with his combines. The artworld stars whose work is avidly sought by contemporary collectors—from Andy Warhol to Jeff Koons—are essentially similar to the Old Masters. Today’s big-name art collectors are just like the great collectors of the past.